Messiah Project Director Lindsey Robison and choral conductor Chris Brammer. 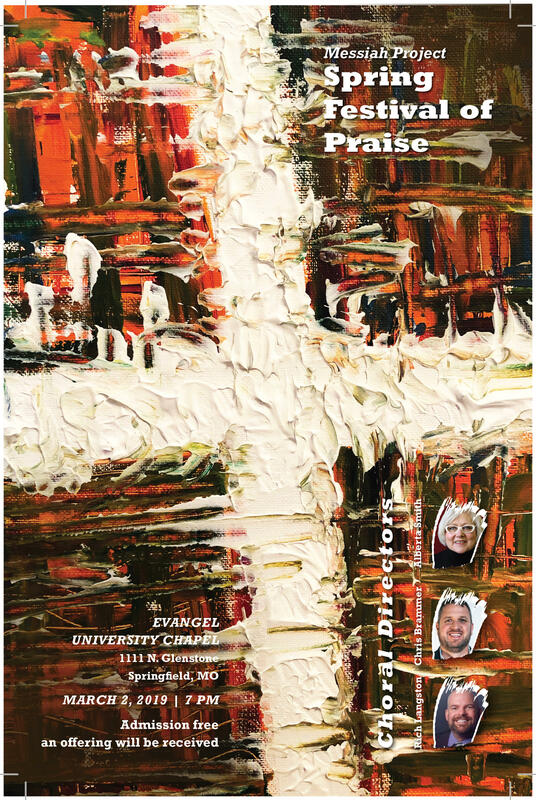 Messiah Project's 2019 "Spring Concert of Praise" is Saturday March 2nd at 7:00pm at the Evangel University Chapel Auditorium. While the current weather forecast doesn’t sound especially spring-like, Messiah Project presents their second "Messiah Spring Festival of Praise" Saturday March 2nd at 7:00pm in Evangel University’s Robert H. Spence Chapel Auditorium, 1111 N. Glenstone Avenue. Messiah Project director Lindsey Robison joined us for “Arts News” to talk about the concert, and he was joined by Chris Brammer, Artistic Director of the Springfield Chamber Chorus and Minister of Music at University Heights Baptist Church. He is one of three conductors involved in the concert. The other two are Alberta Smith, adjunct music instructor at Ozarks Technical Community College, and choral director at MSU’s Greenwood Laboratory School; and Rich Langston, Worship Pastor at Ridgecrest Baptist Church. Brammer’s Springfield Chamber Chorus, some 35 singers, will join Messiah Project’s community choir of approximately 70 singers for the concert, which also includes a visual/dance component courtesy of Messiah Project’s Credo Dance Academy. Brammer says they are “excited” to be involved. “This is an opportunity for us to share our talents with other choirs in the area, and an opportunity to be a part of something that’s been going on for decades,” referring to Messiah Project’s lengthy history in the area. Robison talks about Credo Dance Academy’s involvement. “Messiah Project, It’s kind of our hallmark that we bring dance, creative movement, choreography, into almost everything we ever do. As I say, it’s the last frontier of our worship, as we involve our whole body into honoring the Lord. And that’s what this is all about.” There will also be opportunities for the audience to sing-along. Admission to the concert is free, but they’ll take an offering to help cover costs. New this year is a silent auction to raise funds for Messiah Project missions at home and abroad. Items include dining gift certificates. Lindsey just got back home from a planning trip to Dubai in the United Arab Emirates. “Messiah Project was supposedly the first (performing organization) to bring portions of (Handel’s) ‘Messiah’ to the Kremlin State Palace Theater in Moscow in 2010. The United Arab Emirates has a population of over 200 different nationalities. And the government has just instituted a ‘Department of Tolerance’, and some of my contacts have said, ‘You know, this might be the time to bring a concert similar to what we did in the Kremlin’” to Dubai. It’s still very much in the planning stages at this point, and won’t actually happen until at least 2021. But “it’s in the works,” says Robison (who hoped out loud that he wasn’t jinxing the project by mentioning it publicly so early in the process!). For information visit www.messiahproject.org or call 883-5274.